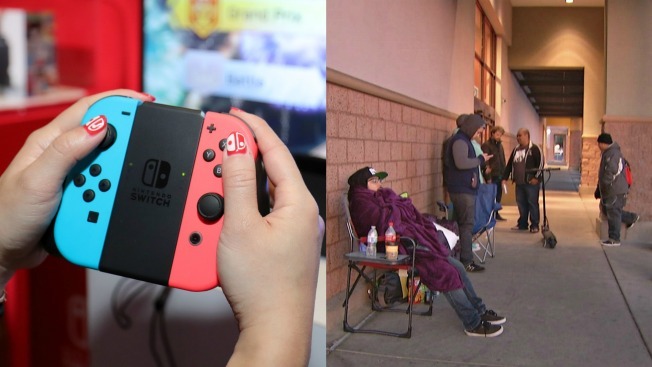 Passionate gamers lined up outside Bay Area retailers early Friday all in the effort to get their hands on the new Nintendo Switch, a gaming system that allows folks to play at home and on-the-go. The latest console from Nintendo, which hits the market at $299.99, features a docking station that houses a screen similar to that of a tablet. When a gamer is in the confines of their own home, they can hook up the docking station to their television and use the system's controller to play their favorite games in traditional fashion. When the user feels like taking the adventure outdoors, they can detach the screen from the docking station and attach the controller to it. Jonathan Flores, protected from the cold by his "Super Mario Bros." blanket, posted up outside of a Fremont Target at 11 p.m. on Thursday in hopes of purchasing the coveted toy. "I just really want one," he said. "I’ve just been a fan all my life. The whole culture has been a big part of my life ever since I was four years old." Wes Ong from Fremont also unfurled his camping chair and braved the elements in anticipation of the gaming system's release. The pediatric respiratory therapist for Stanford Medicine won't be the only one to enjoy the new source of entertainment.